November is National Novel Writing Month, aka NaNoWriMo, and every year thousands of writers sign up at the official website for the challenge of writing the first draft of a 50,000 word novel. It’s proved to be the starting point for over 480 traditionally published novels, including Water for Elephants and The Night Circus, and more than 130 self-published novels. Perhaps yours will be next? Tools for a successful NaNoWriMo: Parker Quink bottled ink for fountain pens, Palomino Blackwing and Faber-Castell pencils, Pilot Varsity disposable fountain pens in blue and pink, Rhodia notepad. Parker Quink bottled ink. If you’re writing longhand with a fountain pen, you are going to want a big bottle of a reliable ink. Parker Quink is beloved by many fountain pen fans and comes in blue, black and blue-black. Palomino Blackwing and Faber Castell pencils. Pens ain’t your thing? That’s quite all right: we have a great selection of Palomino Blackwing and Faber Castell pencils to keep you scribbling away. Rhodia pads. From dot grid to graph to lined, we’ve got you covered. 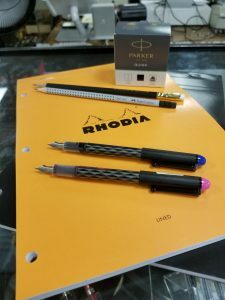 Rhodia paper is great to use with fountain pens, gel pens, pencils, ballpoints…you get the idea. Pilot Varsity disposable fountain pens. Available in 4 different colors, these inexpensive fountain pens from Pilot are great for marking revisions or taking along on group writing sessions. Bonus: you can give these Varsity pens away to fountain pen-curious friends without breaking the bank! Pro tip: If your first draft will be written out by hand, the Conklin Carbon Fiber Word Gauge fountain pen is definitely worth checking out! This clever piston fill pen with steel nib features an ink window etched with numbers to let you know how many words you can write before your ink runs out. Available in black carbon with either blue or clear ink view; select from a fine, medium or stub nib. The Conklin Carbon Fiber Word Gauge fountain pen is a piston fill pen with an ink window that shows how many words you can write before refilling. Perfect for long writing sessions!